Players can spawn and can change classes at their barracks. 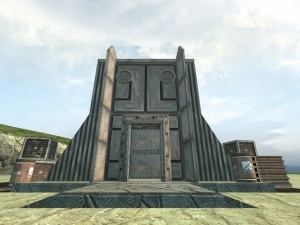 The importance of this structure is second only to that of the refinery, and it is sure to be a prime target in any assault. 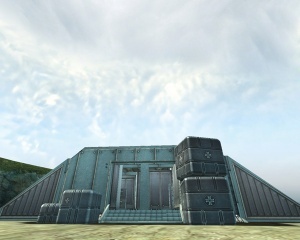 Depending on the map and gameplay type, the match may end if all of a faction's barracks and APCs are destroyed and no players on that faction remain alive, similar to the destruction of a Command Vehicle (when applicable). 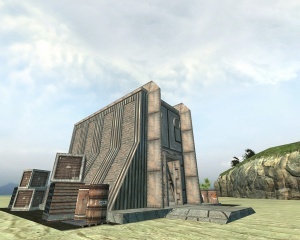 It is important to note (as shown in the images on the right) that the differences between the size and shape of the two faction's barracks is more significant than with most structures; NF barracks are far taller and, as a result, are harder to shield with walls and are much more vulnerable to attack from mortar, rockets, and many tank weapons. You can climb on top of the Brenodi barracks; this is a great position for destroying it or ambushing players. Vehicles, if in the right position, can drive over the Brenodi barracks. Note that not all vehicles can achieve this. Opening the loadout menu and clicking the "Accept" button will reload all your weapons and resupply your ammo, but will not heal you. If you need a significant amount of ammo, you can change to Engineer class inside a barracks, drop ammo outside, then revert to your original class. 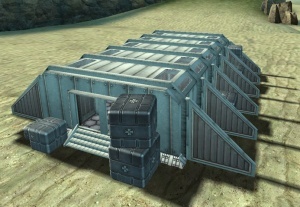 Grenadier's mines will kill many people inside a barracks; use this to keep the enemy occupied. This page was last modified on 5 September 2013, at 00:39.